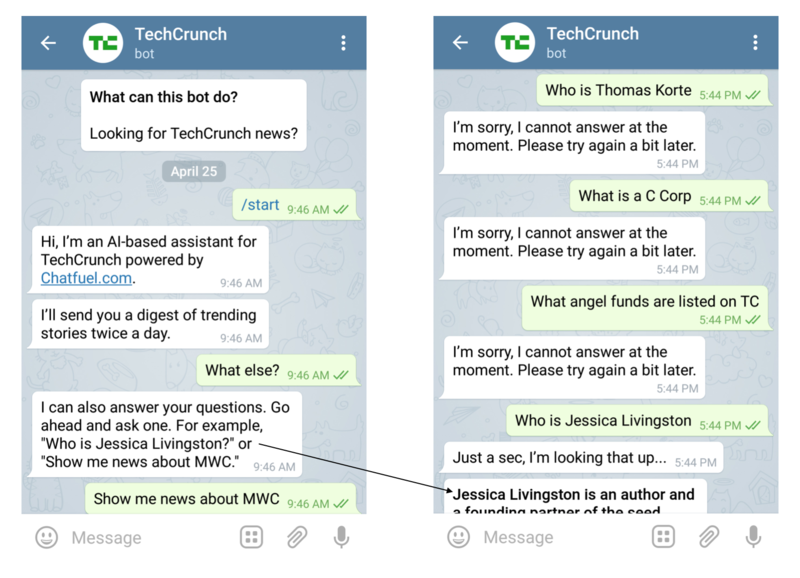 Does your bot do these 5 weird things to your users? 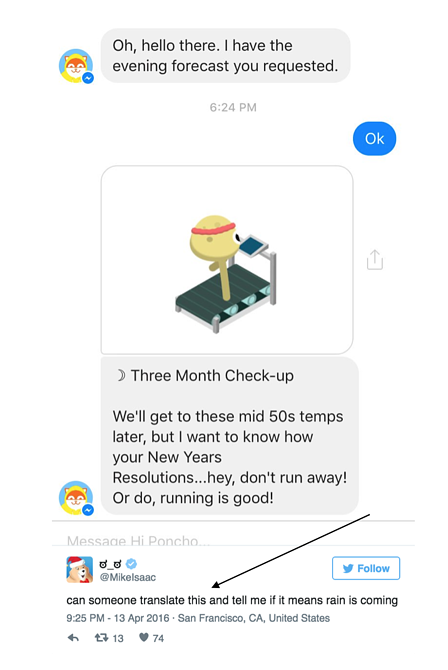 We’ve now seen some examples of live Messenger bots in the wild since their debut at the F8 Conference. Telegram bots have also been around for a while. Some of us had high hopes for bots being actually useful for businesses so that we can prove that the hypotheses around conversational commerce at scale is true. Jokes aside, having a bot out there is a representation of your brand and business, and hence needs to take into account what customers expect of you when they start interacting with it. In some (well-researched) literature, we found that service quality is the difference between perceived service and expected service, which comes from a blend of your brand, past experiences with you, and the customer’s needs. Let’s take a look at some of the more popular bots now and how they may improve their experiences by setting better expectations for users. Does it do what it says? We know that natural language processing has not fulfilled all the promises that people have made about it yet, but it may be better not to create the expectation that the bot can answer everything that the user throws at it in a Q&A format. Perhaps it’s better just to stick to being a news delivery bot? Does it remember what you meant? It’s very natural for us to want to go back up and click a button on a menu that we saw several messages earlier. It’s certainly way easier for us to scroll back up and select them, than if we had to type “menu” or “help” all over again to the same options. However, quite often bots don’t remember the context in which they are supposed to operate and just become confused when you try to tap on older menu selections. It will be a much better experience if the bot could enable the user to just keep going back up to a menu that he or she expects to be there, so that they can continue interacting with it as they intended to. Do you expect your bot to be clever? Sometimes, but probably not so clever that you can’t understand it. Again, an example from the weather bot (it’s just a common example – we still like it) which completely confused users on the day that this came out. People want to be delighted but most of the time bots also serve a utility and it needs to fulfill that core function first, before going above and beyond to deliver great content and visuals. Can you explain why you need these details? Would you like it if someone came up to you at the store just as you step through the door, and asked you where your exact address was? I wouldn’t. Not unless it’s for a good reason that was clearly explained to me, that is. 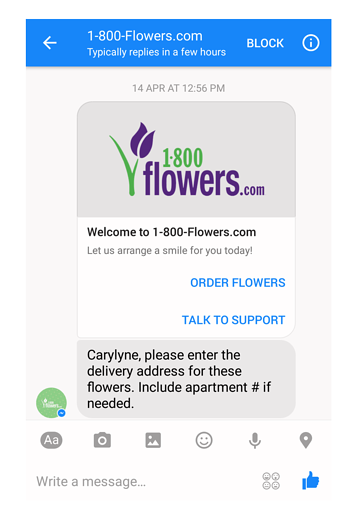 While we could guess that ordering flowers from 1800-Flowers might require your address to figure out if a particular bouquet is available in your area, it may well be construed that it’s just trying to fish out information from you so it can collect your private data to keep it on file. Especially when it gives no explanations about why on earth it needs your delivery information when you have not even browsed, decided on your items, and thought about where the best place to send it to would be. Beyond a poor user experience journey, it’s probably very disconcerting for seasoned shoppers since details like these are usually only collected at the end of the purchase process. Even if it just added a secondary message that said “This is so that we know if the items you want are available in your location”, this would engender a lot more trust and create a lot less anxiety for potential buyers to give up their private information. 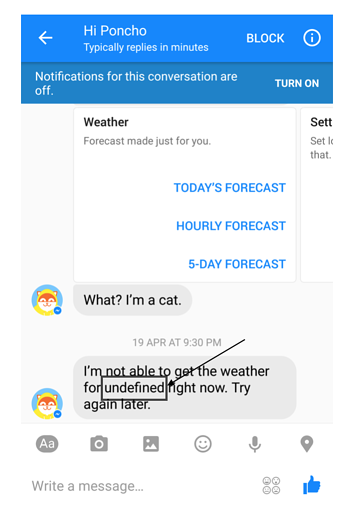 Do your users expect your Messenger presence to be a bot? This isn’t entirely the fault of Messenger managers, since Facebook lumps “bots and businesses” in the same category when you search for brands or companies on Messenger. As more businesses (especially big brands) start implementing bots, users may start anticipating that the party on the other end will not be human. However, in a transitional phase like this, it’s pretty hard to tell. As I found out the hard (strange?) way. 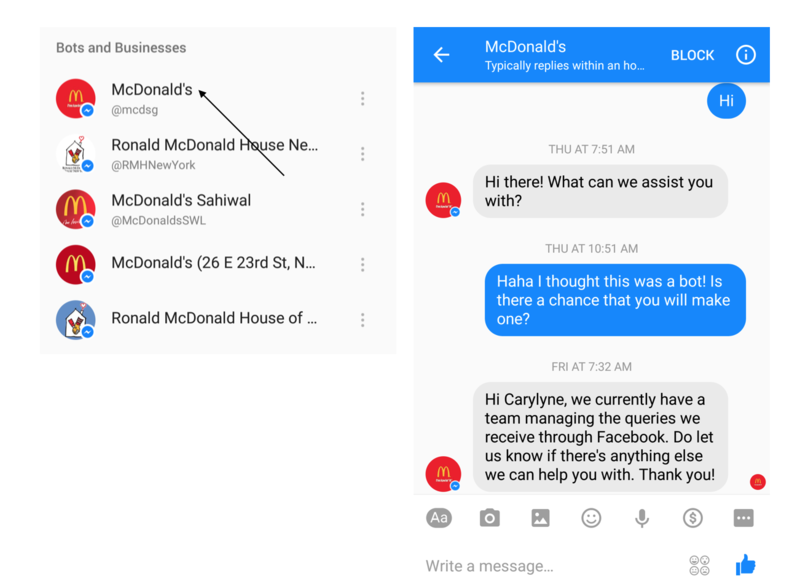 I talked to McDonald’s (a big brand, which we expected to have a bot due to sheer efficiency and volume) thinking that we could find out what their bot could do. Turns out, some 18 hours and 14 minutes later, I get a reply from a human asking me what I needed from them. Setting the Facebook-default autoresponder: “Hi, let us get back to you in 48 hours!” would help a big deal. Though that 48 hours turnaround time may no longer be relevant in today’s day and age; that’s a topic for another time. Use the above anecdotal examples as a way to start thinking about how your bot understands and caters to what your customers expect. 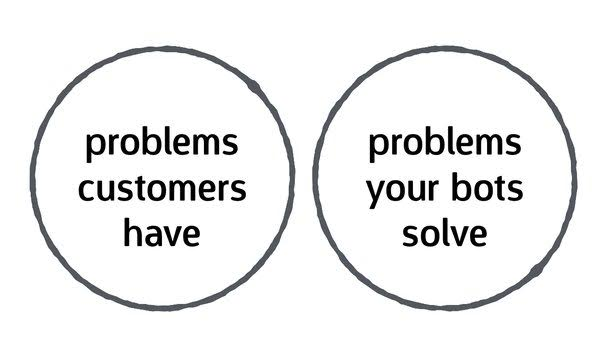 Do you have a service philosophy that your customers already expect? How can you apply that same philosophy to your bot as well? At the heart of it, building a bot that helps customers requires a boatload of common sense and asking yourself what you would think about each interaction if you were the customer on the other end. Always design for the best experience that your customer anticipate from you, especially on a new channel like bots that can potentially scale up your service for you and increase brand innovativeness and loyalty among customers. At KeyReply we make it ever easier to get intelligence and all of these great integrations behind every channel your customers could possibly want to reach you on (Messenger, Telegram, WeChat, etc.) This flexible arrangement means there is a ready and smart chatbot that can take care of your customers 24/7, wherever they are. Sounds good? Request a demo at keyreply.com/iq.